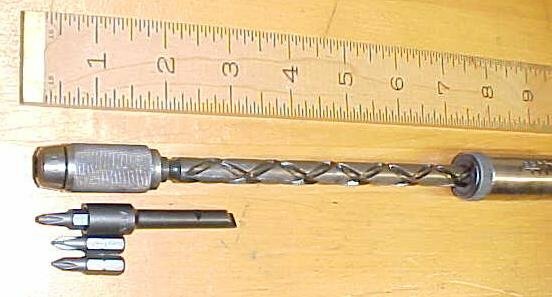 This is a good clean Yankee ratchet / spiral screwdriver No. 30A marked with several Patent date "DEC. 11. 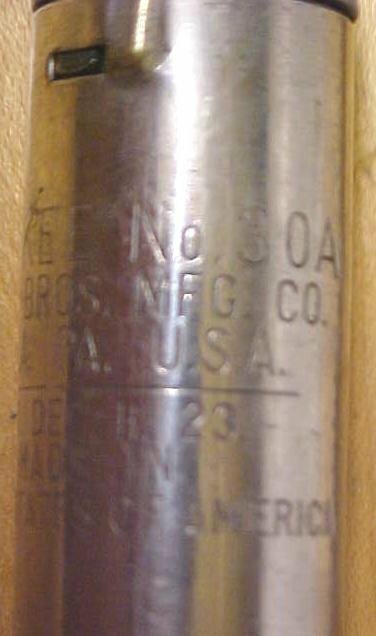 1923, also clearly marked "NORTH BROTHERS YANKEE NO. 30A". Has a good driver tip adapter that is Yankee drive on one end and hex drive on the other, allows you to use common hex drives, and 3 hex bits also included as in the picture. The adapter is made in the USA, and features a lock ring that help secure the hex bit in place (use hex bits with the tiny corner notches only). At least one hex bits is a Philips No. 2 bit and the other is a No. 1 Phillips, all bits and the adapter are new, all in fine condition. About 96% of the nickel plating is intact, and about 95% stain and varnish intact on the handle, a few minor dings in the wood. This type spiral drill is not spring loaded (rapid return) in the spiral area drive area, works perfectly, as from the factory. <br> This one is 16" long overall with no bit in place, fully extended, and uses the 9/32" diameter shank tips. We also sell the adapter for the larger two sizes of Yankee screwdriver separately at this website. Items Similar To "North Brothers Yankee No. 30A Screwdriver w/ Hex Adapter"